Governor Kay Ivey has proclaimed April 2019 as Oral Cancer Awareness Month in Alabama! Did you know that Alabama is ranked 5th in the nation for oropharyngeal cancers, and 7th in the nation for oropharyngeal cancer deaths? 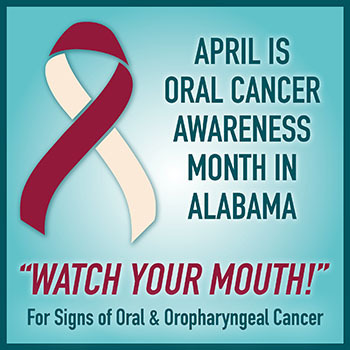 In collaboration with the Mitchell Cancer Institute in Mobile, AL, the Oral Health Office would like to encourage you to "Watch Your Mouth!" for signs of oral cancer. To learn more about how you can help prevent and detect the signs of oral cancer, click visit News and Events. The Oral Health Branch is dedicated to preventing dental disease for Alabama's citizens by promoting and developing quality, cost-effective community and school-based preventive, educational and early treatment programs which emphasize elimination of oral health disparities. Oral Health is an essential and integral component of health throughout life. No one can be truly healthy unless he or she is free from the burden of oral diseases and conditions. Millions of people in the United States experience dental caries and periodontal disease resulting in needless pain and suffering. Dental caries is largely a preventable disease. Preventive, educational and early treatment programs are the focus of the Oral Health Branch. The Oral Health Branch has developed the following materials to help educate Alabamians on the benefits of healthy teeth and gums. The Oral Health Branch accomplishes its mission through several programs. These include oral health education programs and materials, community water fluoridation, and the dental screening program. Oral health data from various sources are available that characterize the oral health of Alabama's children and adults. These include indicators of oral health. Finally, information is available on locating a dentist throughout the state. Public health clinics, Medicaid providers, ALLKids providers, and other dental provider lists are also available. Call (334) 206-2924 or contact us via email to obtain further information.